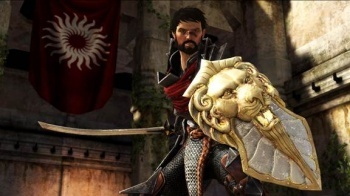 Hawke's tale in Kirkwall has officially come to an end, but BioWare's new project may continue the Dragon Age story. Given the wide swath of opinions about Dragon Age II, maybe it's for the best that BioWare has decided to let it end as it stands. While the game already had two fairly substantial DLC packs, one team at BioWare was hard at work on an upcoming expansion entitled Exalted March. Fans may be disappointed (and detractors may be delighted) to learn that the expansion has been canceled, and the team has been shifted to a new assignment - possibly, BioWare hints, the next entry in the Dragon Age franchise. While it's not clear exactly what Exalted March would have entailed, its status as an "expansion" would probably put it in line with something like Dragon Age: Awakening. Players likely could have expected a fairly meaty adventure that took place after the storyline of Dragon Age II rather than a new side adventure for the main game. Like Awakening, Exalted March may have set the stage for a new Dragon Age game, especially given BioWare's next comments. "[The Dragon Age II] team has fully moved onto The Next Thing (tm)," remarks Mark Darrah, a BioWare executive producer, on Twitter. "We'll be very actively looking for feedback on the next DA title, and will be showing the game more than before as it develops." Darrah does not explicitly state that the team's new project is a new installment in the Dragon Age series, but given the team's expertise and Darrah's interest in reigniting the series, the conclusion seems reasonable. For all the criticisms it endures, BioWare is actually pretty good about listening to its fans. "The most valuable thing we can get out of those meetings is to hear from you on those same topics - what does Dragon Age mean to you, and where would you like to see it go?" asks Chris Priestly, a BioWare community coordinator. "We're excited to hear what you have to say!" You heard the man; get to it!